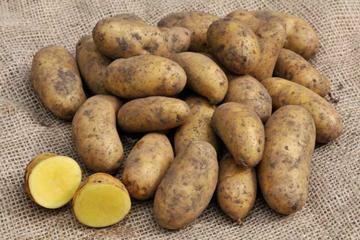 Late maincrop variety, producing long, oval, yellow-skinned tubers with golden yellow flesh of creamy, fluffy texture and excellent distinctive flavour. Tall, spreading plants. Abundant reddish-violet flowers. 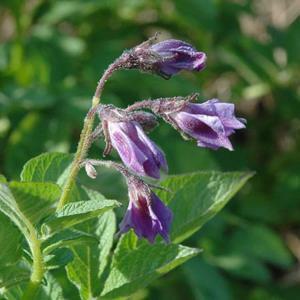 Most fertile, well cultivated soils but dislikes very wet or heavy clay soil. Prefers a slightly acid rich soil with plenty of organic matter, the tubers can be subject to scab on limy, sandy or gravelly soils or those deficient in humus. Likes a sunny position. Culinary vegetable. The first commercially available variety of this type. Considered to be of gourmet quality. Much faster to cook than normal varieties. Can be used for boiling, mashing, roasting and frying. Contain high levels of carotenoids, beneficial to health. Developed at the Scottish Crop Research Institute, Invergowrie, Dundee, Scotland, registered in 2001. Specially bred for the UK and Northern European climate, using an original Peruvian species parent. All the green parts of the plant, even green parts of exposed tubers, are poisonous, containing a toxic alkaloid called solanine.